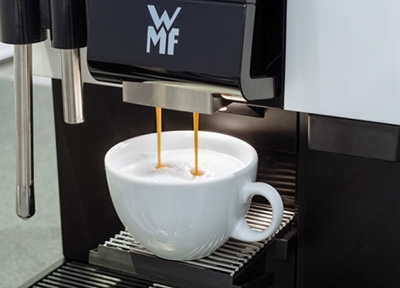 The WMF 1100 S – the compact, fully automated coffee machine using professional technology. The WMF 1100 S caters to every taste. For hot beverages either with or without milk. With or without milk foam. Espresso, ristretto, cappuccino, café crème, espresso macchiato, milk coffee, chociatto or latte macchiato. Fast and directed guidance thanks to the intuitive operating concept with swipe function. Easy cleaning of the milk system with the patented Click&Clean function that is tried and tested in catering operations: it is no longer necessary to disassemble the milk foamer every day, and manual cleaning is required just once a week. Bringing the cup to ideal temperature in a cold room is essential for perfect taste and aroma. 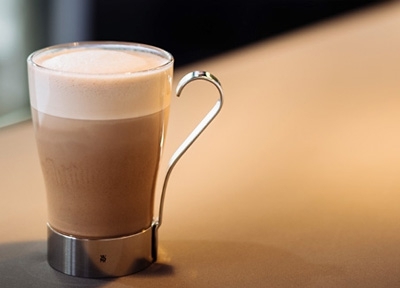 WMF 1100s has a steam jet function, which works at the touch of a button. Whether hot milk or hot milk foam, thanks to the basic milk system the consistency, temperature and taste are always spot on. With the integrated chocolate dispenser, tasty chocolate beverages such as milk choc or chociatto are just a touch of a button away. WMF MyCoffee App: Create your personalised coffee recipe right from your smartphone using the WMF MyCoffee App. It doesn’t get smarter than that. Simply select your favourite recipe, adjust the amount of coffee, milk and foam, enjoy and then share the recipe with others. WMF MyCoffee App.